Cover: Ryan Brown and Steve Lavigne, maybe? Deep in the heart of the bayou, a thief named Jess Harley skulks through the swamp in search of the hut of a creepy voodoo practitioner named “Mary Bones”. Sneaking into her abode, Harley swipes a large crystal orb and leaves for New York City in hopes of selling it for a major profit. 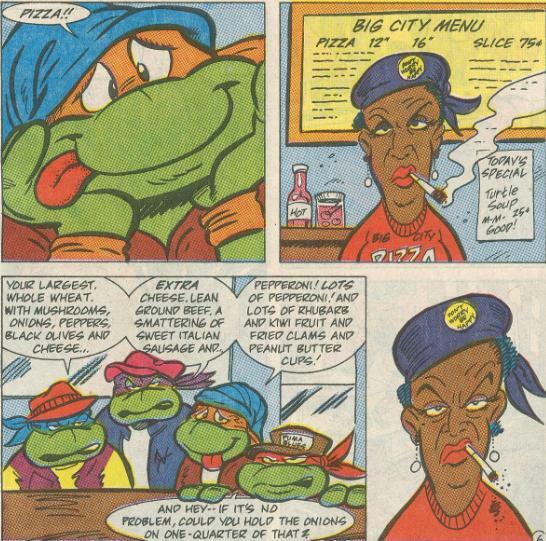 While navigating the hectic streets, Harley bumps into the pizza-bound TMNT (incognito) who accidentally knock the crystal from his hands and down a storm drain. 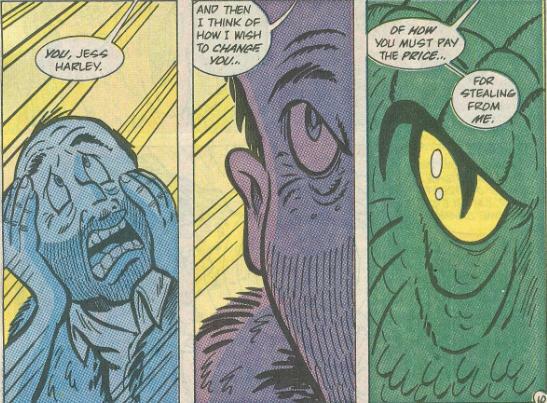 Harley chases after it through a subway access tunnel, but he finds more than just the crystal when he gets there. The old swamp witch, Mary Bones, has finally tracked him down and is in the mood for a little vengeance. She reveals to him that the crystal ball he stole is actually called the Turnstone, though some like to call it a “directional thought transanimator”. With those words, Jess Harley is transformed into a walking alligator-man. As “Leatherhead” desperately tries to stop the exiting Mary Bones, he passes right through her intangible form and crashes through the floor, plummeting several levels until he lands, conveniently, into the hidden base of the Shredder. Shredder, Bebop and Rocksteady rouse the unconscious Leatherhead, who explains his tragic situation to him. Thinking fast, Shredder reveals that both Bebop and Rocksteady are victims of Mary Bones’ Turnstone (having once been an accountant and a real estate agent, respectively). He also points out that the Teenage Mutant Ninja Turtles are in cahoots with Mary Bones and hold the secret to turning Leatherhead back into Jess Harley. Leatherhead wastes no time, and with Bebop and Rocksteady in tow, heads out to find the Turtles. Back within the Technodrome (still stuck in Dimension X), Krang is enjoying an Intergalactic Wrestling match (featuring Ace Duck) when he’s interrupted by the Shredder. Shredder reports the latest goings-on to Krang, who realizes that in order for Mary Bones to have something as technologically advanced as a directional thought transanimator, she must therefore be a banished warlord from Dimension X, like himself. He declares that the Turnstone is likely the only thing that can get him back his original body and orders Shredder to retrieve Leatherhead, as he’s the only one who knows where Mary Bones lives. Elsewhere in the sewers, the Turtles ride their Cheapskates (available at a toy store near you!) to a subterranean bridge they’ve been dying to explore. There, they are met by Leatherhead and crew who engage them in battle. 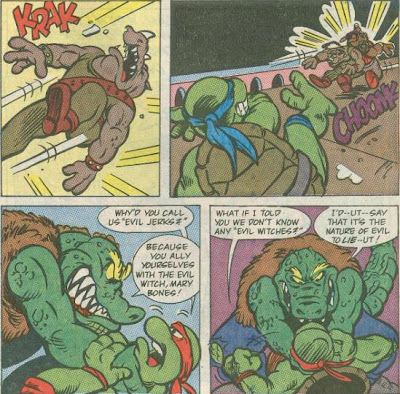 Leatherhead and Raph are at each other’s throats until Raph points out Leo’s honorable actions in battle and Rocksteady’s dishonorable actions. As Leatherhead starts to get a grip on who the real badguys are, Shredder arrives and reveals that he’d been using him all along. Leatherhead, in his grief, accidentally destroys the bridge and plummets into the abyss. *The Technodrome was sucked into Dimension X in TMNT Adventures (miniseries) #3. *Though Ace Duck makes a cameo on Krang’s computer monitor, he won’t make his first full appearance until next issue. *Mary Bones will appear again in TMNT Adventures #11. Her true nature and origin will be revealed in TMNT Adventures #12. *Leatherhead seems to have a tendency to battle the TMNT on subterranean bridges. He does so in his first appearance in Mirage continuity, in Tales of the TMNT (vol. 1) #6 as well as in the Konami TMNT Arcade game. *Say goodbye to Krang’s robot body, because you won’t be seeing it again after this. *This issue was reprinted in the UK by Fleetway in TMHT Adventures #9. Well, it’s another new character/toy introduction, but unlike the last issue, this one begins a story arc that’ll run for quite some time, eventually culminating in TMNT Adventures #13. So in that respect, it feels like an awful lot more than a 28-page toy commercial. As mentioned above, Leatherhead has been saddled with a large number of different origins, with this one deviating the most from all the others. In all honesty, I prefer this version of Leatherhead over all the rest. He has the sympathetic qualities that the Mirage version contained, but all the Louisiana trappings of the Fred Wolf version (sans phrases like “Ah gua-ran-tee!” and endless rants about gumbo). In that regard, the Archie Leatherhead is really “the best of both worlds”. Not much else to say here, really. We got a good origin for Leatherhead (who will come into his own as an excellent character later down the line), some funny shtick with Shredder, Bebop and Rocksteady and the beginning of a very good story arc. Not a bad issue, all things considered. Just a nerdy correction for your entry's accuracy. You fight Leatherhead on a bridge in The Manhattan Project! IIRC, the bridge level was in Turtles in Time, which did have an arcade version. 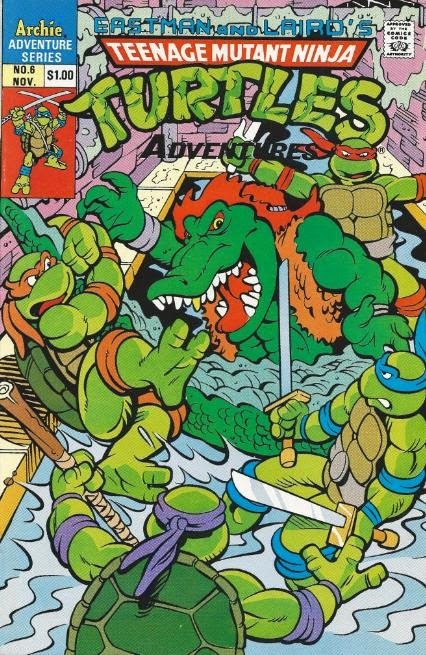 IIRC, the bridge level was Turtles in Time, which did have an arcade version.